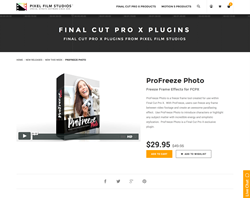 "ProFreeze allows FCPX users to freeze any frame between video footage and create an awesome parallaxing effect that will take your project to the next level," said Christina Austin - CEO of Pixel Film Studios. 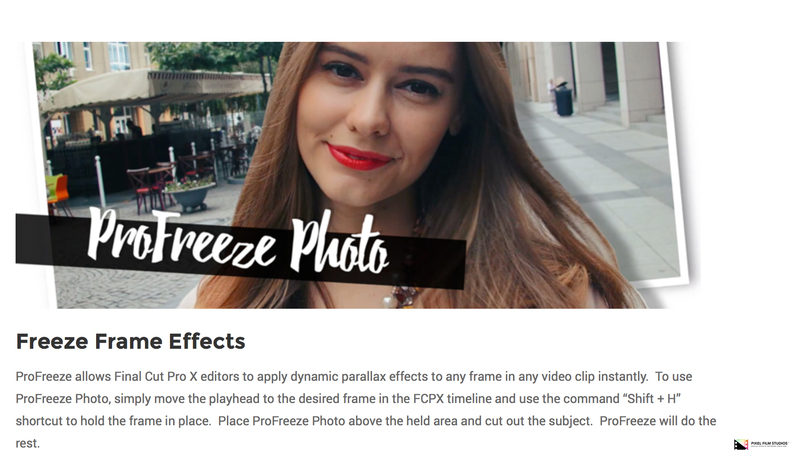 ProFreeze allows Final Cut Pro X editors to apply dynamic parallax effects to any frame in any video clip instantly. To use ProFreeze Photo, simply move the playhead to the desired frame in the FCPX timeline and use the command “Shift + H” shortcut to hold the frame in place. Place ProFreeze Photo above the held area and cut out the subject. ProFreeze will do the rest. ProFreeze Photo pulls video subjects out of their environment and into the foreground. Easily adjust the color, width, and drop shadow of the picture frame with sliders and color swabs. 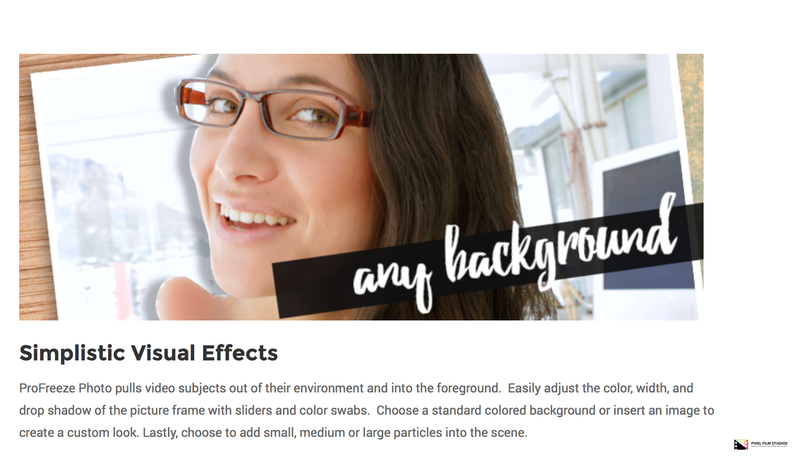 Choose a standard colored background or insert an image to create a custom look. Lastly, choose to add small, medium or large particles into the scene. After cutting out the subject, look to the “Cut-Out Controls” and to determine where the subject will animate to. Adjust the X & Y position of the cut-out to adjust its horizontal and vertical orientation respectively. Change Z position of the subject to alter the depth. 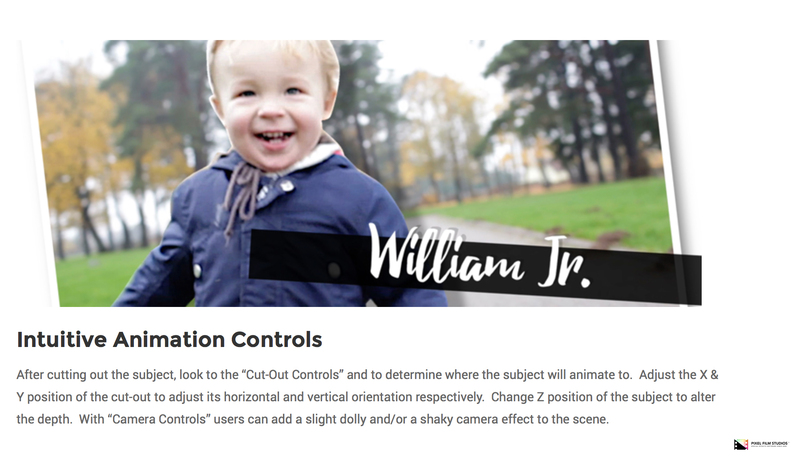 With “Camera Controls” users can add a slight dolly and/or a shaky camera effect to the scene. ProFreeze features a built-in masking tool to cut-out and highlight the character or object within a given scene. To use the masking tool, start by clicking around the subject and completing the mask. Double-click the line to add a point. Double-click a point to change its curvature. Command + double-click on a point to delete it. With these simple controls, user can refine their cut-out selection. 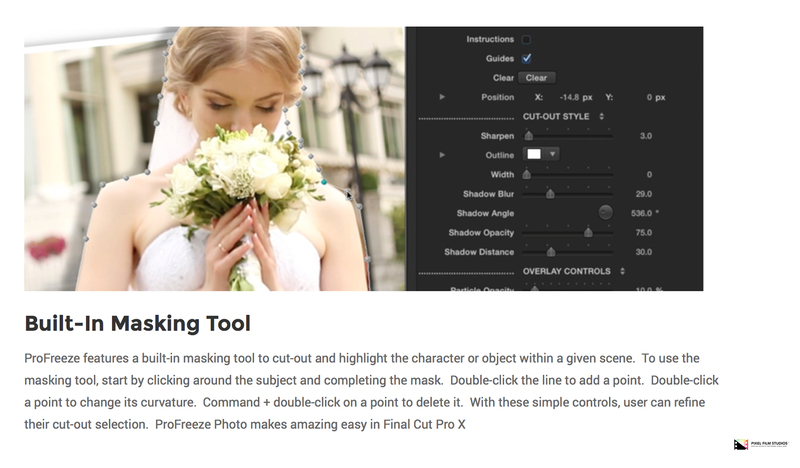 ProFreeze Photo makes editing easy in Final Cut Pro X.